Mesopotamia is Greek for "between the rivers." 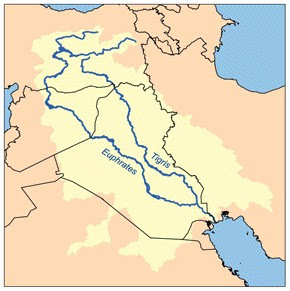 Specifically, the rivers referenced by this term are the Tigris and Euphrates Rivers that run through modern-day Iraq. These two rivers, and the land between them, are often called the "cradle of civilization" because the civilization that developed there was likely the first ever on Earth. If we go back to the characteristics of a civilization, we know that one of the first requirements is a surplus of food. It makes sense then that the people that settled in Mesopotamia did so to utilize the life (and food) giving waters of the Tigris and Euphrates rivers. Like other river valley civilizations (Egypt, the people of the Indus River Valley), the people of Mesopotamia relied heavily on fairly regular spring floods that spilled the rivers over their banks, leaving behind extremely fertile soil when the waters receded. The melting snows that fed the Tigris and Euphrates came from the Taurus Mountains to the northwest in modern Turkey and the Zagros mountains to the north in Iran and Turkey. The Tigris and Euphrates were of course used as a water supply and to irrigate crops, but they were also important for transportation and trade. 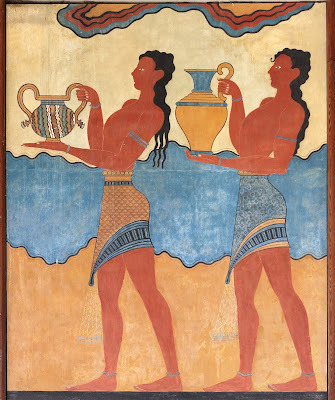 Mesoptamia was a cross-roads of the early ancient world for trade between Egypt, India and China, and the people leaving on the eastern shores of the Mediterranean, a region called the Levant. Like most of the great rivers of the world, the Tigris and Euphrates have been dammed to control flooding and harness the power of the moving waters. As a result, Mesopotamia is much less "green" in modern satellite images than it would have appeared even a few centuries ago. The deserts have reclaimed much of the land between the rivers, including much of the marshlands that were once plentiful there. The deserts also reclaimed a chunk of the Persian Gulf, where the Tigris and Euphrates Rivers join and empty. You can see this clearly on the satellite image. 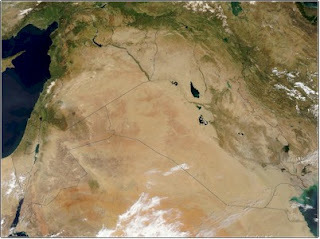 The area of desert all the way up to the darker, more fertile looking region was once part of the Persian Gulf. The Fertile Crescent is a term often used to describe Mesopotamia. In fact, the Fertile Crescent actually includes Mesopotamia all the way to the mouths of the Tigris and Euphrates plus the fertile plains, plateaus, and forests of the Levant region along the coast of the Mediterranean. When a line is drawn around it, the region forms a reverse crescent, hence the term Fertile Crescent. Some textbooks and maps even include the lower Nile River valley as part of the Fertile Crescent. However you define them, the fact remains that Mesopotamia and the Fertile Crescent were home to some of the earliest and most powerful civilizations, and that was due in large part to the life sustaining waters of the Tigris and Euphrates Rivers.